I cannot.believe it is July 1st already. I am not sure where June went. relaxing in the hammock and recharging kind of weekend. 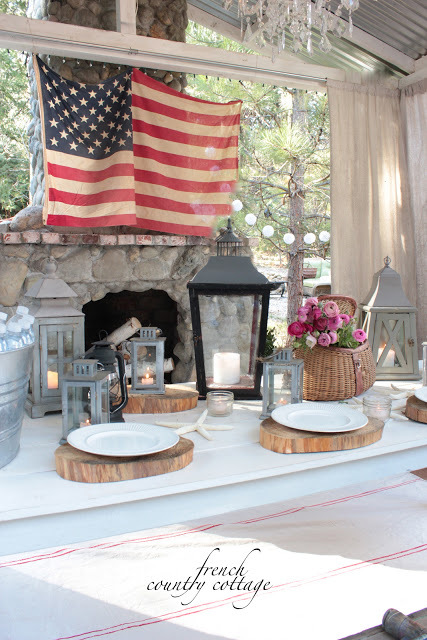 I thought I would share 5 of my favorite red, white & blue decor ideas that are simple and inexpensive to put together. Last year with the drought in California and the huge risk of fire with fireworks- most celebrations were fairly quiet and sparkle free. As in red and white striped pillows and flags in a soap bottle in the living room. More red, white & blue touches here. Red stripes like the ones on grain sacks bring a little bit of patriotic cheer. And there was that time I wanted to create a huge grain sack striped tablecloth for Christmas. And it came to mind as a perfect thing to use for a rug as well. Creating your own huge 'grain sack' table cloth or rug is inexpensive, versatile and so easy to do. Read more about the project and find the DIY instructions here. but I can't help but see those tattered marks as a symbol of how much that flag means. And kind of like our elders- they should be honored and cherished. So, I honor those 'elder' flags and enjoy them- wear and all. 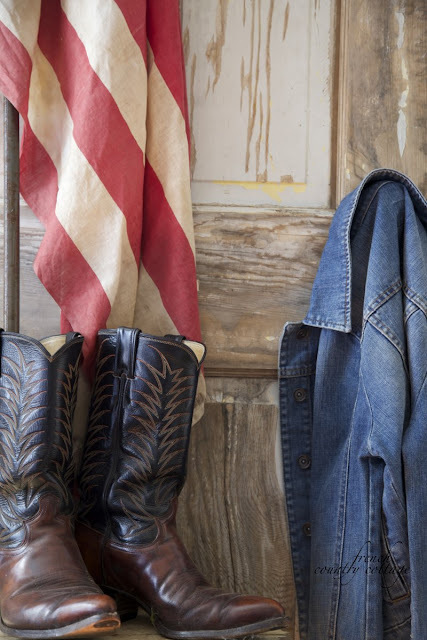 I used a rustic door as a backdrop, a flag, pair of old boots and a denim jacket. to welcome friends coming over for 4th of July festivities. 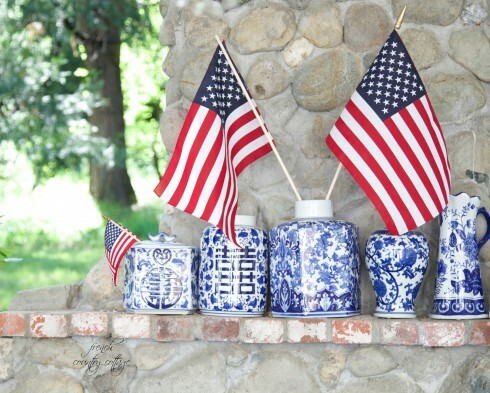 Maybe one of my favorites- the red, white and blue with blue and white pottery. 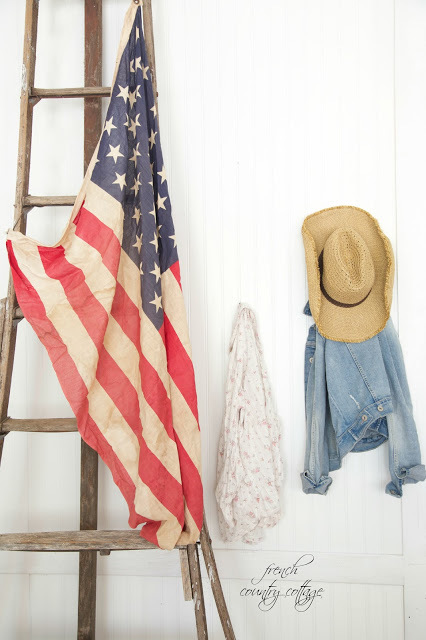 Can't help but love that patriotic twist on a favorite collection. This one doesn't get much easier. Simply add flags to your collections. 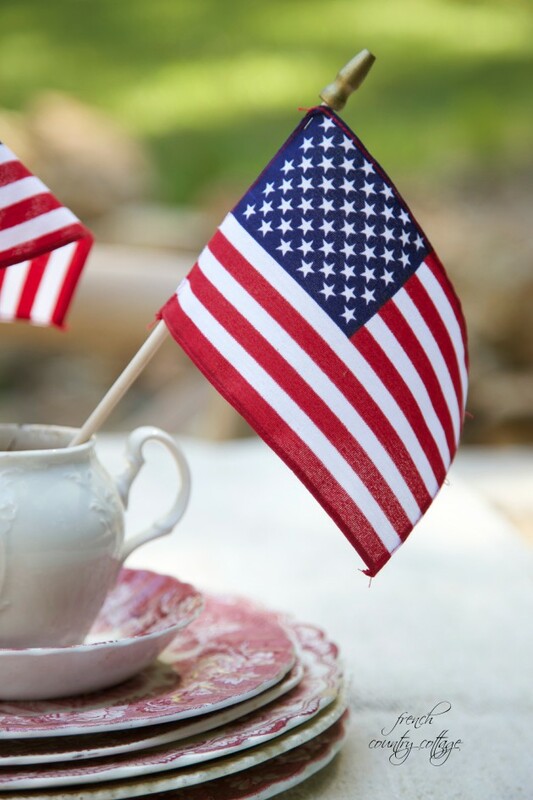 Those little fabric flags are everywhere right now-so pick up a few this weekend and start sprinkling them here and there. A couple large ones in larger pottery and small ones in little pitchers. so you don't have to go crazy. or as colorful as the driveway lined with little flags. so there may be a few more simple ideas coming your way. that might involve twinkling lights and a green tree. Christmas in July over here. 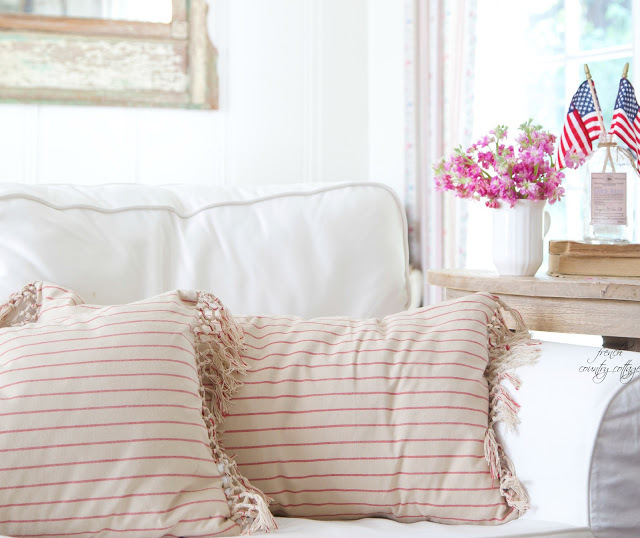 I have red in my home all year long - so I love to add some touches of blue to make my home ready for the Fourth. Like you, I don't go too crazy with my decor for the Fourth of July, but I do like to celebrate. Those little flags make life easy and fun. Thanks for your tips! I am with you on flags. It depends on the context. If it's respectful, then old is beautiful. As for fireworks, I far prefer a professional show to a nail-biting, don't-have-a-drink-because-you-might-have-to-call-911-or-drive-to-the-hospital amateur efforts. I should add that no other country flaunts its flag as much as the USA. People in other countries tell me it's because we Americans don't have as much (AS MUCH, which is not to say nothing, but still) to be ashamed of. That we keep it that way. We'll be flying the colors, on the 4th, and when the Tour de France goes by our house (!!!) the week after. Beautiful! I didn't do much here, but I did bring out my Uncle Sam collection. I love your clever use of red, white and blue!